Jeanie Cockell is an educational and organizational consultant who designs collaborative strategies to surface the wisdom of individuals and groups so that they can build positive futures and respond effectively to change. Her consulting practice is grounded in her adult education background including higher education teaching and leadership roles. She travels worldwide to facilitate workshops, speak at conferences, and consult for clients. Joan McArthur-Blair is a writer, speaker, and facilitator. She has held roles in higher education from faculty to president, and every day of that journey she cared most deeply about learners, their access to higher education, and their success when there. After more than twenty-five years of institutionally based work, she has returned to her loves of writing, speaking, and facilitating, and works with groups to make a positive difference. 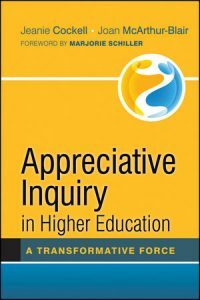 Appreciative Inquiry in Higher Education: A Transformative Force provides practical guidance on how Appreciative Inquiry, long known as a valuable approach and process for change management and group development, can be applied in higher education and make an impact on the next generation of positive change makers. The authors, noted AI practitioners committed to the use of AI in higher education, weave together their theories, concepts, and unique stories with those of colleagues from around the world to show how AI can harness the drive and imagination of individuals, groups, and institutions. The book builds on the foundations of AI and takes the reader on an ever-deepening journey of how AI can be used to help leaders, practitioners, faculty, and organizational developers achieve new and evolving goals. Designed as both a thought-provoking and a practical resource, Appreciative Inquiry in Higher Education reveals why AI is such a vital process and shows what it takes to apply AI to such tasks as planning, summits, developing collaborative teams and groups, and teaching and learning. The book gives practitioners the theoretical concepts to ground their work and links AI to the positive psychology and strengths work that has influenced educational approaches in the first decade of the 21st century.